My mom unfortunately just had knee surgery as she torn her ACL while on vacation last week. Thankfully, God protected her and allowed the surgery to go over wonderfully. When she woke up the morning after her surgery the night before, she was very hungry and thirsty, as she couldn’t eat the day of her surgery, but solid food just didn’t appeal to her. So before I headed off to my 4 hour organic chemistry class in the morning, I created her this delicious smoothie. In recovering from an illness or injury, it is so vital to maintain a healthy and clean diet. My mom just recently came off of the whole30 program, so she is use to eating clean, but I wanted to make sure these first few weeks of recovery were filled with only clean, healthy foods. Definitely no sugar (sugar decreases your immune system greatly!) Also, when being on pain medications, some problems arise (digestive to be exact, I’ll spare the details), so I knew I wanted to keep her smoothie dairy free, and load it up with some healthy and fresh fibrous ingredients. 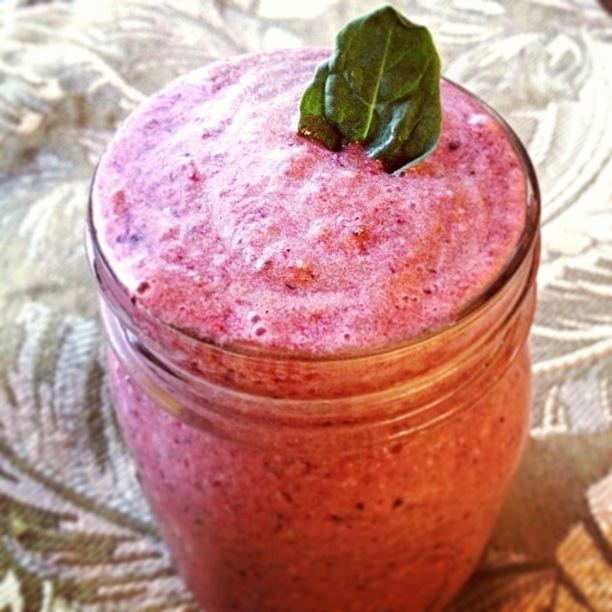 What resulted, was a delicious smoothie, flavored with apples, berries, and coconut, AND free of added sugar, whole30 qualified and paleo-friendly! Directions: Blend all ingredients together in blender. If desired, add honey (not whole30 qualified). Sometimes, you just want a big salad for dinner. The solution: a huge, fresh salad creation full of fiber filling ingredients, and topped with a protein to keep that stomach satisfied! I made this salad for my mom the other night, and she loved it! She was completely satisfied the whole night..of course, until I made her my healthy chocolate protein mug cake(recipe on site)! If you’re wanting a lighter meal, this is a great option. 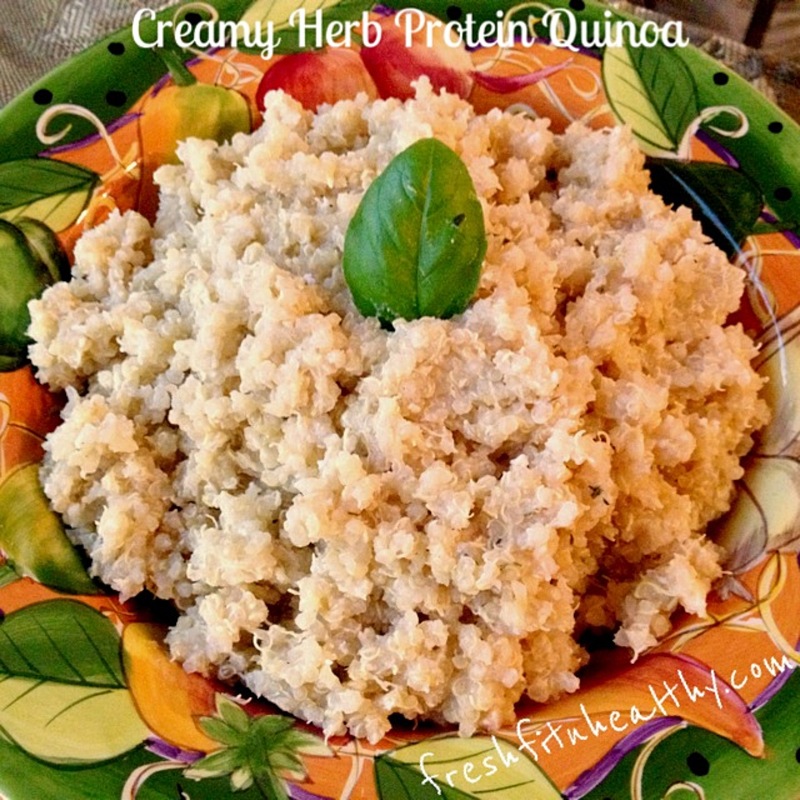 If you’re wanting a more filling, satisfying meal, this is still great, just add a big serving of protein on top! Grilled chicken, salmon, or even steak would be yummy. Directions: cut up enough lettuce and arugula to fill plate. Cut up all veggies and place on salad mix. 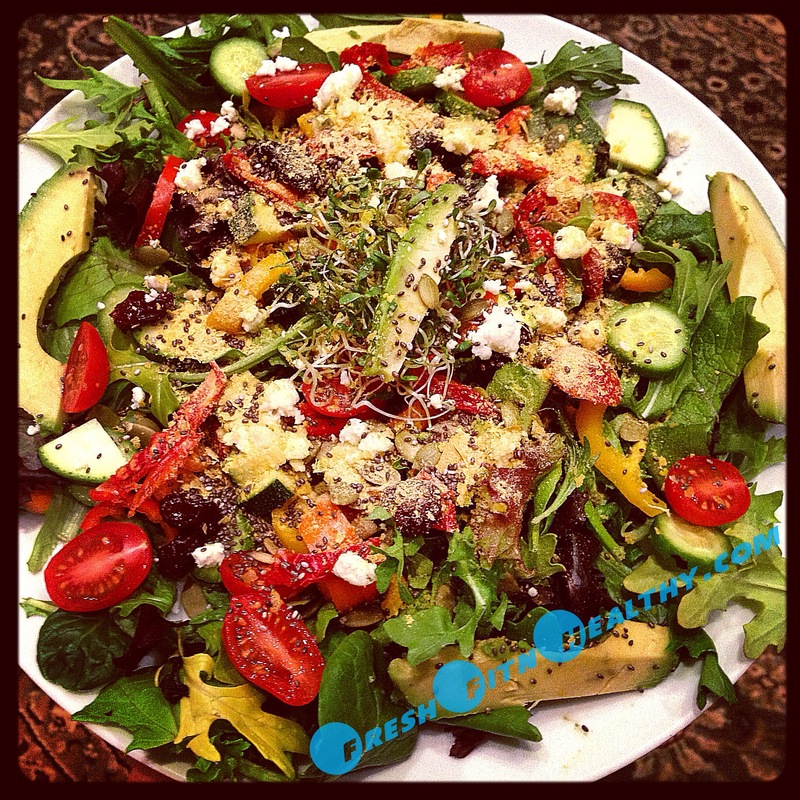 Sprinkle nutritional yeast, seeds, nuts, cheese, and dried fruit on top. Drizzle oil and vinegar over all. Top with protein if desired. Enjoy! Quinoa. [KEEN-wah]. Yes, I am putting the pronunciation because I was pronouncing it wrong myself for a long time embarassingly :) A grain high in fiber and protein. But I love adding just a little bit more protein to my grains. It not only has it’s nutritional benefits, but it makes it oh so fluffy. Yes, I used “fluffy” to describe quinoa. But let me tell you, it is the perfect description. How do I add protein you may ask? It’s all in the whites..egg whites that is! If you stir them vigorously into your grain of choice (quinoa, oats, rice), it doesn’t get “eggy”, but only fluffy and delicious! But there is also 2 other ingredients that lend the creaminess in this recipe. And nope, it is NOT cream or butter. But it does add even more protein and flavor! Directions: Bring quinoa and water to boil, reduce to medium heat and add in ranch dressing powder, salt, and garlic; cook until most water is gone. When most liquid is gone, add in egg whites and stir constantly for about 3 minutes. Take off heat and add ricotta cheese, stirring until thoroughly mixed. Enjoy! 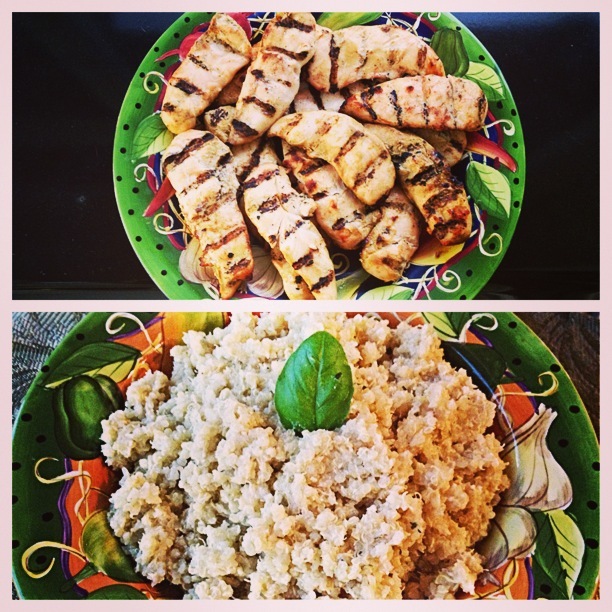 Enjoyed my quinoa with chicken off the grill! I use to have shakes every single night. It was just something I loved and enjoyed ending my night with. But ever since I began this sugar detox, I haven’t had them very much. Why you may ask? Well, the base of most of them were protein powder, and then were definitely sweetened with stevia and other delicious, yet sugar filled ingredients:/So, I had to put them on hold as almost all protein powders have sugar added. 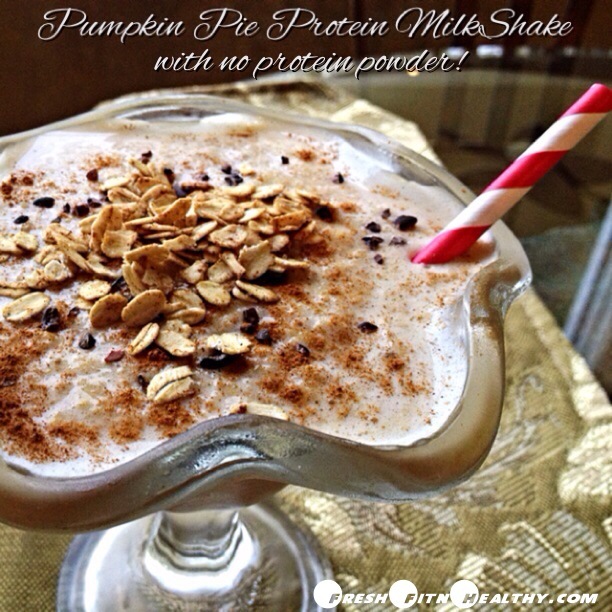 Of course, as I begun my shake creating again, I had to start with the very loved, pumpkin flavor. Pumpkin Pie to be exact. Let me just say it was absolutely delicious! With this shake being so healthy and full of protein, enjoy this for breakfast, post workout, or for a delicious dessert! Directions: Blend all shake ingredients together. Mix together “crumble” ingredients in small bowl or cup. Pour shake into glass and top with oat mixture. Enjoy! 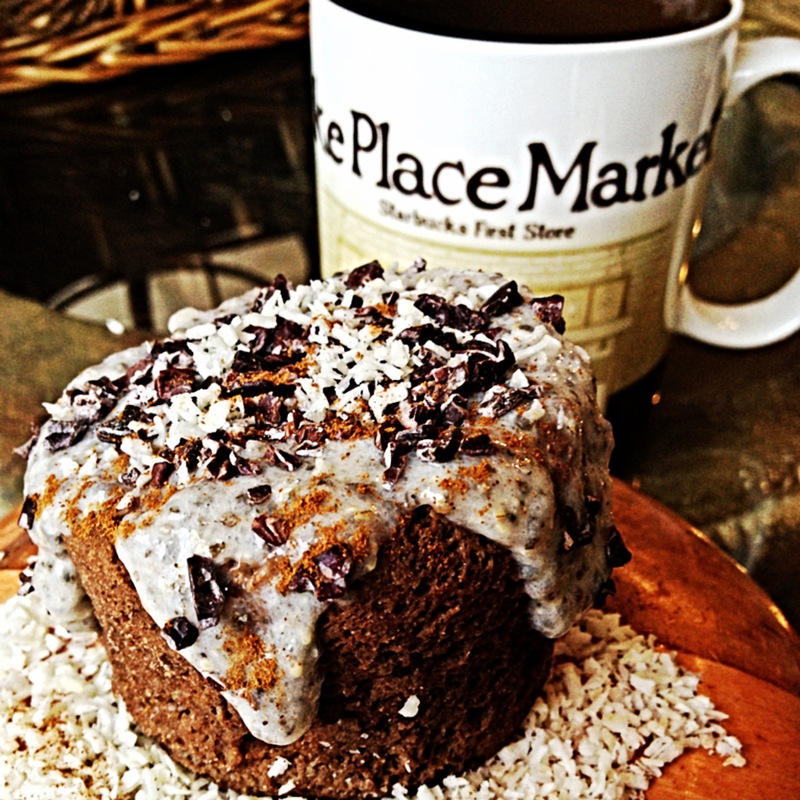 Why are mugcakes one of the best recipes ever to make? All you have to do is mix together a base for the “cake”, add the flavors you are wanting, pour it into a mug, and place it in the microwave for a minute or two. What could be easier than that?! The inspiration of this flavor came from a local coffee shop I have up at my university. I wanted something new, something different. And when I told them I like chocolate and I like coconut, they created me what I would like to consider a little taste of heaven, and Mocha Coconut Latte. I knew I had to recreate these flavors when seeing one of my favorite health accounts on instagram hosting a mugcake challenge, TastyHealth. If you haven’t checked her out on instagram or on thw web, you should do it now. This lady is amazing! Directions: Mix all ingredients together in bowl. Spray mug and microwave for 1.5 minutes. I could eat a whole container of hummus with carrots. It’s just so good. On sandwiches as the sauce, on crackers, or or as a dip for veggies..you can never go wrong by having hummus in your fridge! 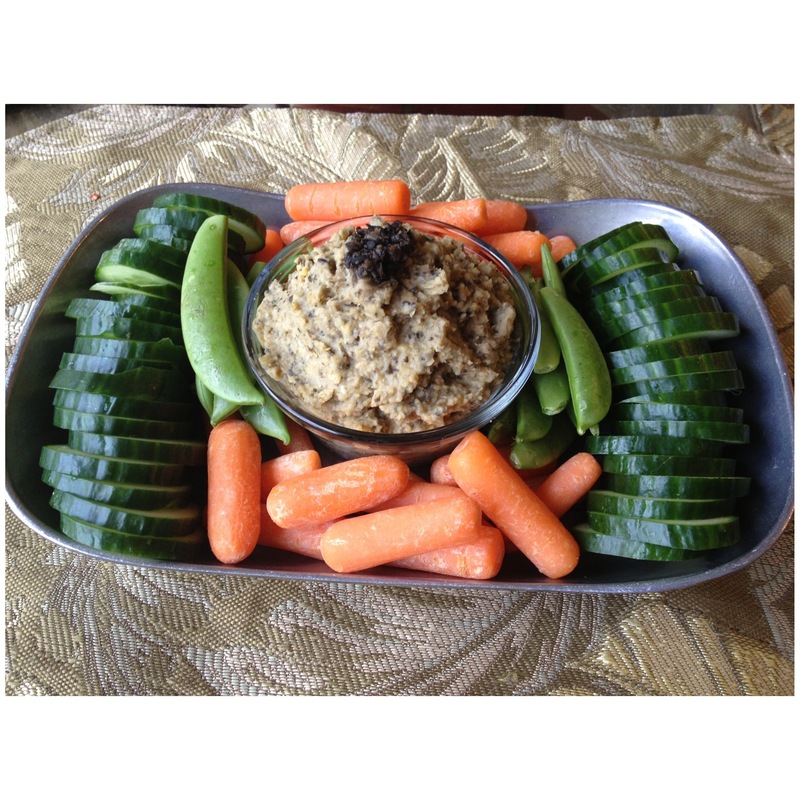 It is such a great appetizer to prepare when having people over too. I always make this hummus when guests are coming, and it is always the first bowl I’m refilling! But did you know that hummus is made of a lot of oil and tahini (basically ground sesame), when buying packaged? That is what give it that oh so smooth texture. But because of those ingredients, just two tablespoons of dip is quite costly in calories. And let’s be honest, who truly only eats two tablespoons? The way I have created this hummus, allows you to enjoy guilt free, as it is made of almost nothing but chick peas, olives, and spices! And it is just as delicious as the other stuff. Everyone is always asking for the recipe, so I thought I would share it with you. Directions: Place all ingredients in a food processor. Blend until smooth. If needing more liquid, add more reserved liquid from canned chick peas. Enjoy! 3) High in vitamin A, which helps fight cancer and maintain healthy eye sight. 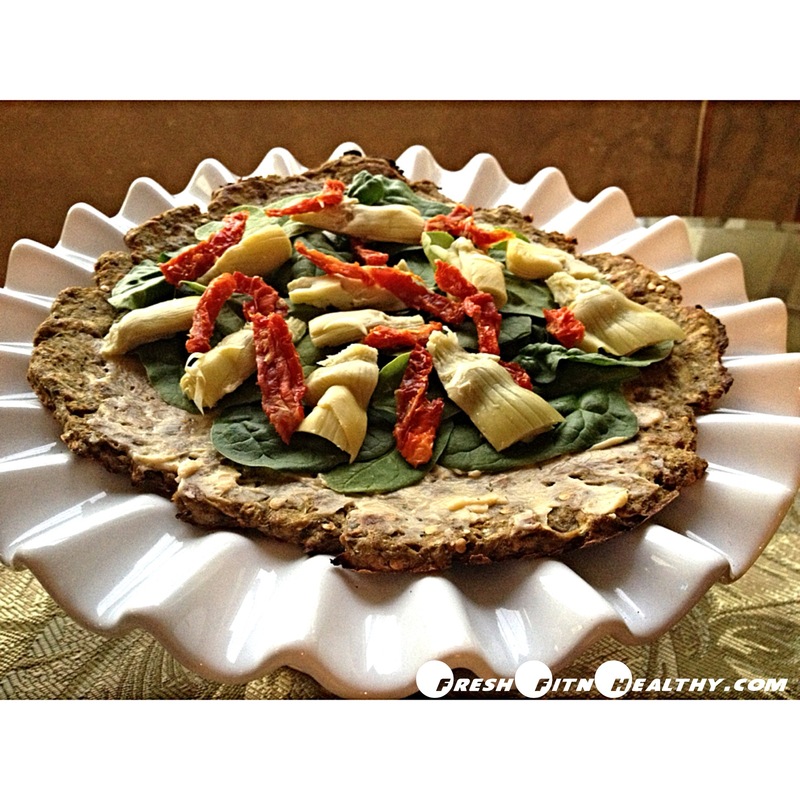 Everyone has been making cauliflower crust..but have you ever tried an EGGPLANT crust?! I had an eggplant that needed to be eaten soon. And just happened to be in the mood for pizza too. As I thought about taking out some cauliflower to make a crust, I thought, why not try using eggplant?! And guess what? It turned out amazing!! I was so in awe when tasting this, as I didn’t know what to expect. I was keeping my mind open, and was hoping for the best. And thank goodness I gave it a try! I enjoyed it BETTER than a cauliflower crust! Directions: Preheat oven to 400 degrees. Remove outside skin of eggplant (can use potato peeler), and shred it. Place it in a towel and squeeze to take as much liquid as you can out of it. Allow it to sit in towel for 10 minutes at least. Then place the shredded eggplant in a bowl and add other crust ingredients. Mix to combine all ingredients. Place a piece of wax paper on a cookie sheet, and spray it lightly with cooking spray. Place “dough” onto wax paper and spread out to thinness you desire in a circular shape. Place sheet in oven for 20 minutes. Remove. Take another piece of wax paper, and flip crust over on to that one. Put back on cookie tray and cook again for another 10 minutes. Check to see if done. If crust is as desired, take out. If desiring a more crunchy crust, cook for 5 minute intervals until done. Take tomato basil cheese out of wrapper, and spread onto crust. Cook spinach for a minute or two, just enough to slightly wilt it. Place artichokes and sundered tomatoes on top. Sprinkle with sea salt or season salt and enjoy!